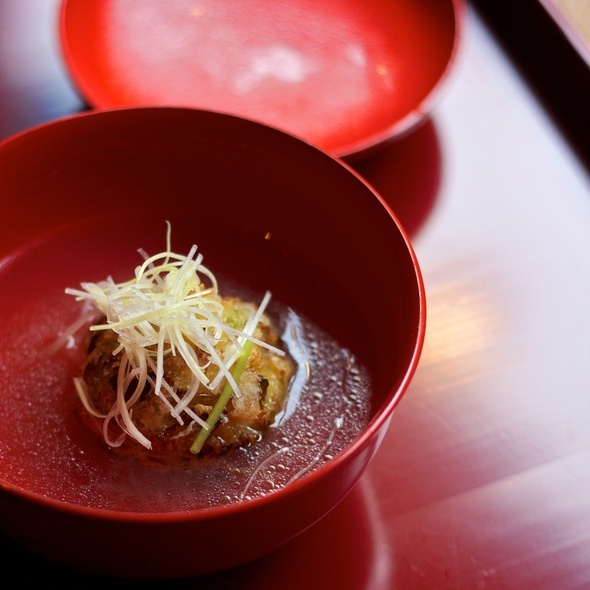 Kajitsu serves Shojin cuisine--vegan Kaiseki, a traditional Japanese culinary practice that is the very origin of Japanese cuisine. Please allow 2 - 3 hours for dining. All of our dishes are prepared from fresh, seasonal vegetables, legumes, wild herbs, seeds and grains, chosen at the moment in the season that best reflects their flavor. At Kajitsu we make our delicious and wholesome dishes from high quality ingredients prepared with traditional Japanese culinary techniques. Really great vegetable focused meal. Not as decadent as other tasing menus, but the unique and interesting food makes it well worth a visit. This was as perfect a dining experience as I can imagine. Every single plate or bowl looked perfect and was presented perfectly. Yes, there were a couple of small bits of food I didn't like but that is my personal taste. It is difficult to answer the 'value' question. We didn't go to Kajitsu to get full of familiar food, we went for an ultimate experience of dining and new tastes and the cost was justified by the experience. The dinner was ample; even though we had the 8 course rather than the 10 course meal, we both were pleasantly full and did not finish the last and main dish. Nice vegetarian menu. Could have had a few more mushrooms but the ingredients were fresh and the dishes had good flavor. Service was excellent. Good for a special occasion. I really loved Kajitsu. The fact that they are doing such interesting things with vegan cooking is fantastic. 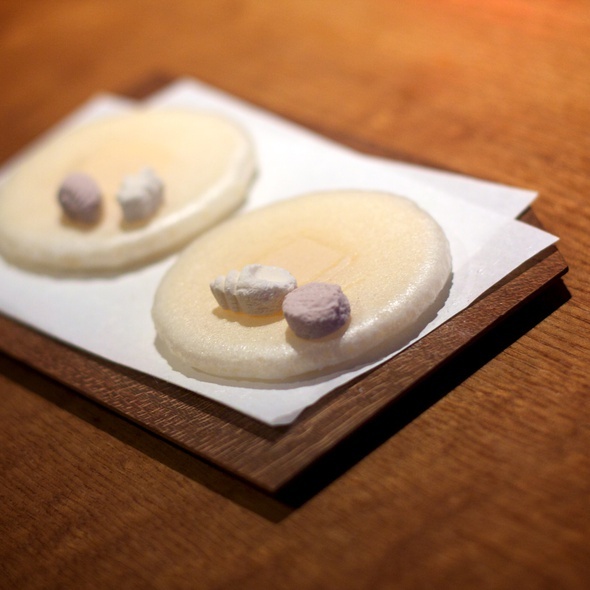 The omakase is definitely worth it, as is the sake pairing. The ambiance is fairly casual but the food was so good that it didn't matter. Would recommend perhaps adding 1 more ingredient for variation as the flavors did start to taste similar with just a focus on two types of asparagus and bamboo and so many courses. Would definitely come back. What an unbelievable experience. 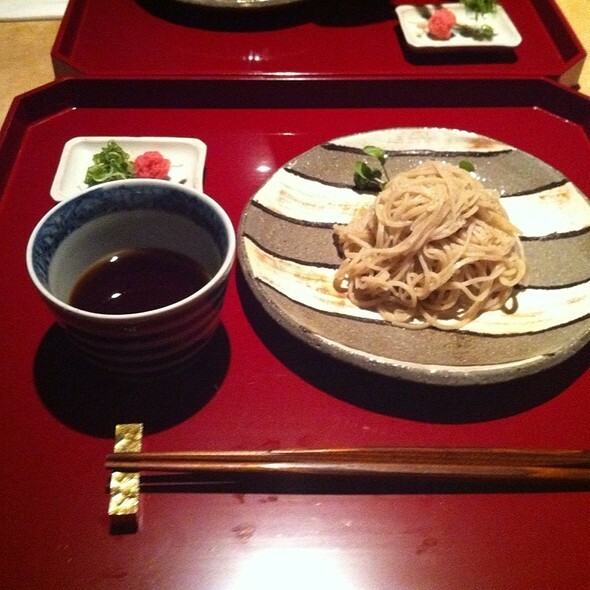 We had wanted to go to Kajitsu ever since we learned about their style and philosophy. We took the opportunity to go to celebrate our friend's birthday. We selected the omakase tasting with the tea pairings. About 8-9 courses. 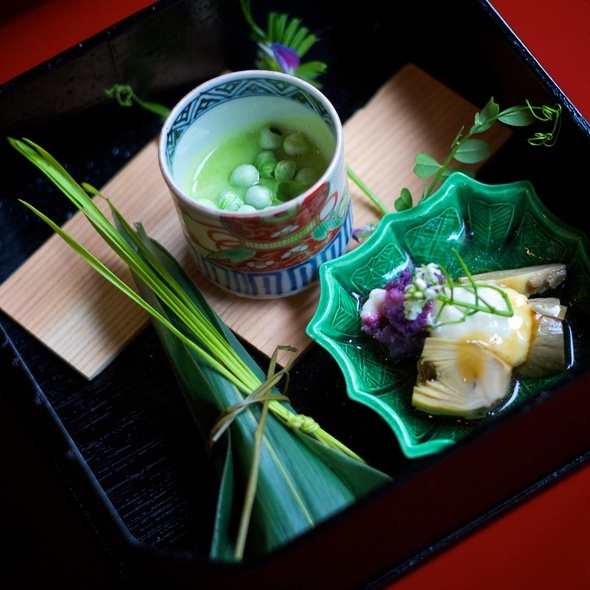 Our seasonal vegetables were bamboos from Kyoto, green asparagus from local farmers and white asparagus from France. Our dinner was incredible. Each dish with its own preparation technique and flavor profile. All the tastes were delicate and thoughtful. Everything was beautiful and very elegantly served. Our servers we absolutely lovely. And they made the birthday celebration extra special by offering us a champagne toast at the end. Unforgettable, wonderful experience. Everything was absolutely incredible. 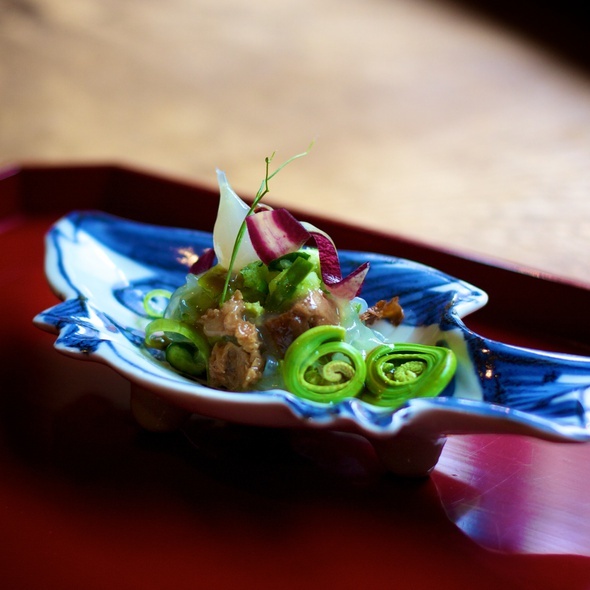 The Shojin cuisine is a must-try for everyone and I wished I lived in NYC so that I could frequent Kajitsu. 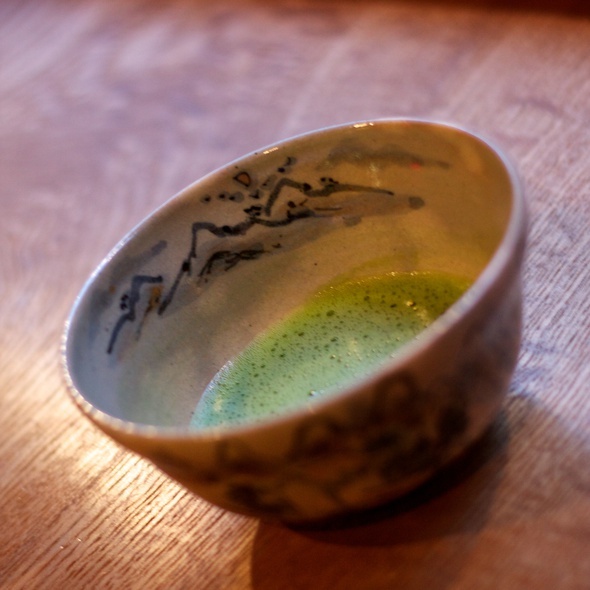 The tea pairing was was quite delectable and worth seeking out for diners that prefer spirit-free pairing options. Everything was absolutely spot on. Just our fellow diners were loud talkers but since it is in the US, and not Japan, that is to be expected. Super intimate and quiet.. the food is superb. Service and ambiance all on point. Highly recommend. Expensive but every bite was worth it. 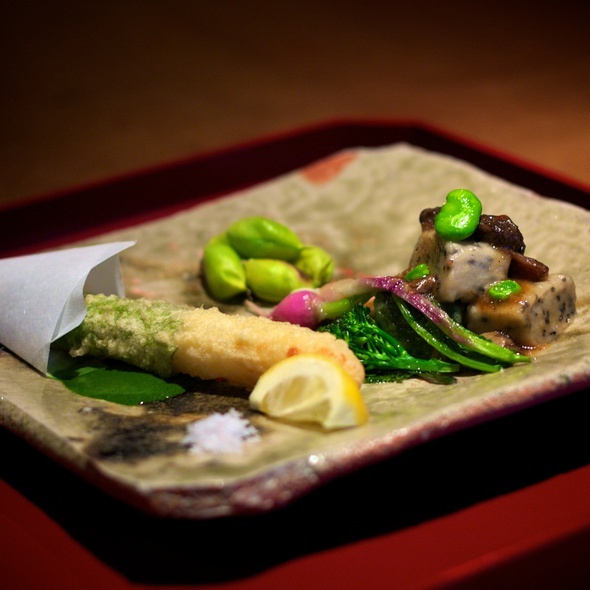 The best vegan japanese restaurant in Manhattan. Imagine Kyoto without the meat. Delicious! We go each month this month food was extra amazing! More food than I can eat in one sitting but wonderful!! Food preparation was excellent but ingredients could have been more varied. The one off note was the gigantic bowl of udon in a thick gelatinous soup at the very end, which should have been half the size. Exceptional! Went for my husband's birthday dinner. Not loud or rushed, incredible 12-course omakaze that felt well worth the value. Think of it as dinner and entertainment tickets in one! I am a total fan of Kajitsu; it's just a wonderful place where kind people who care about food and other people work hard to make a wonderful experience for guests. Our host/server William went out of the way to make our evening special. The ambiance is quiet and calm and is conducive to savoring the subtleties and beauty of the food, which opens hearts and mind to meaningful (and playful) conversation. Kajitsu is a very special place and I hope to return for similar wonderful evening for many decades to come. Compliments to the chef, of course! This was an amazing experience for us non-vegans and our stick vegan guest. Food was unbelievably Delicious and filling. Amazing experience, so unique and creative! We both loved it and they had such exceptional service as well. Will definitely return ! Great food. Kajitsu maintains traditional Japanese delicate seasoning using common American veggies while adding some kick/twist to it. We had a great time at Kajitsu! The staff were both professional and friendly, they provided a description of every dish and were ready to cater for our needs. We came to celebrate an anniversary and they made sure to have a special attention for that, which was lovely. The decoration is minimal, the furniture is simple but everything is beautiful and peaceful. The excellent soundproofing and temperature control were especially nice. Now for the most important: the food is, like one could expect, delicious. Lots of fresh and seasonal vegetables get the focus (we went in early March and had lots of broccoli, daikon raddish, peas, turnip, cabbage, favae beans). I have been to a couple gastronomic restaurants in the past but never experienced dishes were the central point was the taste and consistency of veggies. It was truly excellent (of course, no dish consisted of ONLY raw veggies). We also got to taste various kinds of tofu which was very interesting, especially since I had never had high quality tofu before. Overall I would absolutely recommend Kajitsu for a great meal in a beautiful restaurant. To give an idea of the price, we ended up paying a little over $100 per person for dinner (before tip). Quite expensive and quite exceptional vegetarian offering. Calm setting. Staff attentive. 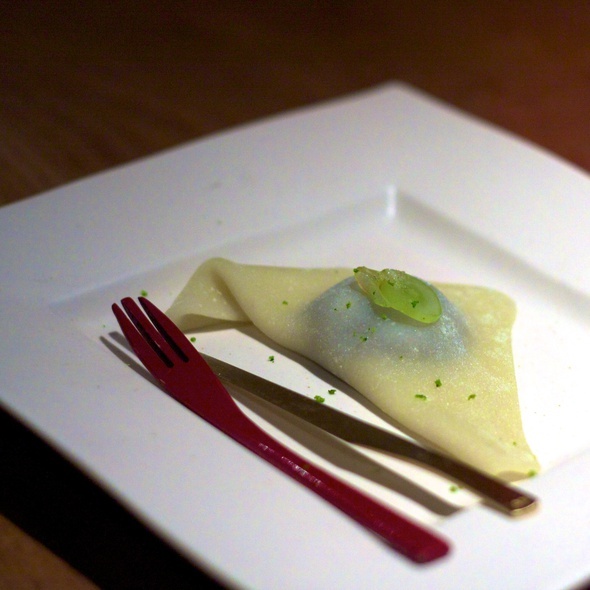 Descriptions of dishes are so hushed and reverent that they cannot be heard. Extremely overpriced. Extremely for what you get. The service was amazing but the food was mediocre. Sake was very good. But still not worth the price. Once we entered, we were quickly seated and informed on which options we could choose for dinner. Afterwards, service was amazing. Before each dish, we were told the ingredients that were used and the way it was cooked. It was very informative. Due to the Zen Buddhism vegetarian style cooking, the atmosphere was Zen too. They really made it a wonderful day of celebration by giving us complementary dessert and sparkling wine. My daughter and I enjoyed our experience. I was so full though I felt I would pop. Definitely plan on a meal that lasts 2+ hours with all of the various courses served. I personally wish they would have reversed the order of the courses, as I enjoyed the later courses more than many of the earlier courses and yet by the time we got to the later courses, I was stuffed. I also figured out too late in the game that you can ask them to wrap up food you don't eat to take home. I would have done this more with many of the courses earlier on had I thought to ask. All in all quite a presentation! Super expensive though. When I evaluate the quality of the meal though, I'd expect to spend a fair amount. That said, I would have felt better if the total price had been $200 vs. $300 for 2 people, water, and a glass of wine. Highly recommend it to any food lovers! My go-to place for Japanese vegetarian fare. Went with the full omakase and nothing was bad. Loved the sesame tofu monaka sandwich and the fried taro with truffles. They also have a nice sake collection. Would definitely recommend. Nice place. Interesting dishes that are very eclectic and different. A lot of the dishes tasted very similar though which was disappointing. Overall, nice place but not worth the expensive price. Our experience was awesome. We are not used this kind of approach:eating slowly and mindfully admiring tableware, food presentation and taste every single bit. We have to repeat. 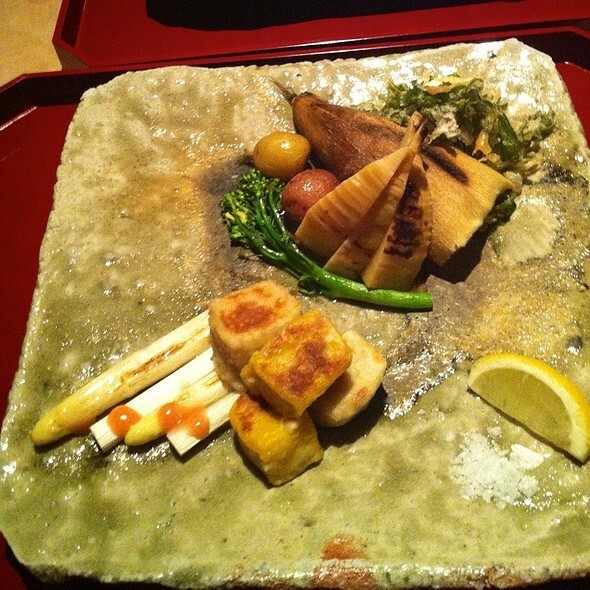 Impeccable service and amazing food (I'm not vegetarian but did spend 2 years in Japan so appreciate your cuisine). Wonderful birthday treat to myself. Gochisosama! A wonderful dining experience in a Zen atmosphere. The Kajitsu experience is one that I would recommend to anyone. This will go down as one of the most memorable meals I've ever had. The food is simply exquisite. The only thing I would say is that in the context of the overall philosophy, the portion sizes were a bit too large. We both felt that we had eaten too much by the end, but it was too good to not finish every bite! Service was incredibly nice + professional as well as knowledgeable. We went for a birthday and had a great experience. Very pricey but worth it to pretend to be fancy for a night. This was quite possibly the best dining experience I have had in New York City. Beautiful, reverential atmosphere. Superb, cheerful, informative wait staff. The tasting menu was... incredible. Plant-based paradise. Incredible experience. I have never endured such a unique dining experience. Everything felt intentional and well thought out. Plenty of local ingredients and absolutely everything was made in house. Dining was almost meditative. The chef deserves all the respect he can get. We celebrated our engagement at the restaurant at it was perfect. Amazing service, staff were very friendly, helpful and very knowledgeable of the ingredients and the menu. One of the best restaurants I've been to! Will definitely return! This is an incredible restaurant. The food is of the highest quality. The flavors, textures and experiences are superb. A very special place, of the highest quality. Everything was perfect and nothing was lacking. I felt wonderful and lucky leaving there.